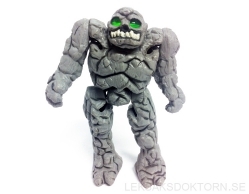 Granok from the cartoon serie Inhumanoids. The figure is in good condition, but have a few flaws. The figure got paint underneath the feet, the rubber bands are a bit worn. Limbs are loose. Very little paint wear. Granok got a "Glow in the Light feature" which makes his eyes glow when light hit the transparent plastic on the top of his head.